1 MELT Spread in large nonstick skillet over medium-high heat and cook shrimp, stirring frequently, until shrimp turn pink, about 3 minutes, stirring in garlic during the last 30 seconds of cook time. Remove and set aside. 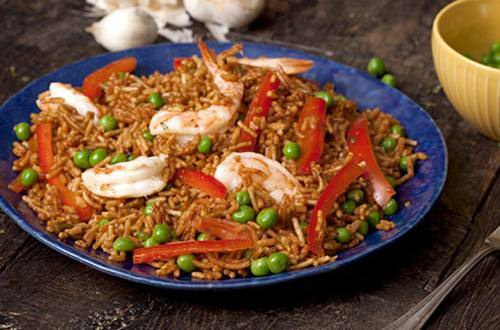 2 PREPARE Knorr® Fiesta Sides™ - Spanish Rice in same skillet according to package directions, stirring in peas and peppers during the last 5 minutes of cook time. 3 STIR in shrimp and garlic.